My name is Ethan, I am 18 years old, I live in Canada, and I am a male. 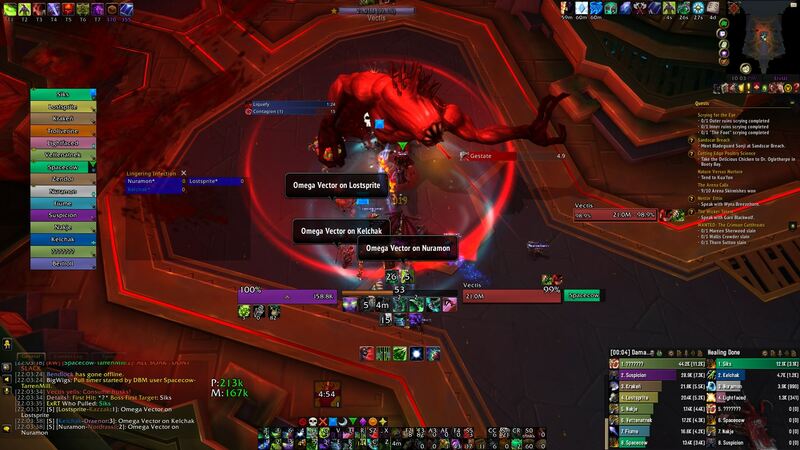 Haste main stat till 15-16% so you get maximum gcd's within your demonic. Then you use crit/vers for flat damage. Mastery is the worst ST stat by a long shot so it is unused. 1. Blind Fury - Gives you the most fury and DPS out of the other 2 talents for the demonic build. 2. Immolation Aura - Gives you the most fury when mixed with blind fury over the other 2 talents. 3. Trail of Ruin - For 1 target and 2 target cleave is the best DPS, 3 or more targets or burst aoe you use fel barrage. 4. Netherwalk - For the most part in a raid setting Netherwalk is generally better over Soul Rending. 5. First Blood - Best all around DPS for any build you're playing. 6. Master of the Glaive - Generally the best so you can get more gcd's and damage off if you have to go out of melee, other 2 are just as good depending on the situation. 7. Demonic - Best DPS for every situation within current meta. Resources - Please tell us sources you follow to keep up to date with your class: Bloodmallet, Class discord, Patch Notes, streams. Guild history and reason for leaving them: Scuffed was my first guild, was looking for somewhere that had players with more motivation to play the game. I then joined Azshari Vegans and left due to not getting a proper trial and just being sat with no reason to it. Expectations - What do you expect from us and what can we expect from you: I expect to be treated with respect as a member of the guild, you can expect me to do to the same. Can expect me to be motivated to improve as much as possible and to put as much effort in to keeping up to date with my class(es) and the raid content. My discord tag is Ethan#1226 if you'd like to talk on voice.